Captain Iakinthi Tzanakaki won a special ‘Woman of the Sea’ Award at the Greek Shipping Awards 2014 for her action in protecting her tanker, Amphitrite, and its crew, during an incident when strong winds threatened cargo discharge at the Total terminal in Beirut. A Cretan islander by birth and a graduate of the Merchant Marine Academy of Aspropyrgos, she is currently a serving tanker Master with Tsakos Columbia Management. 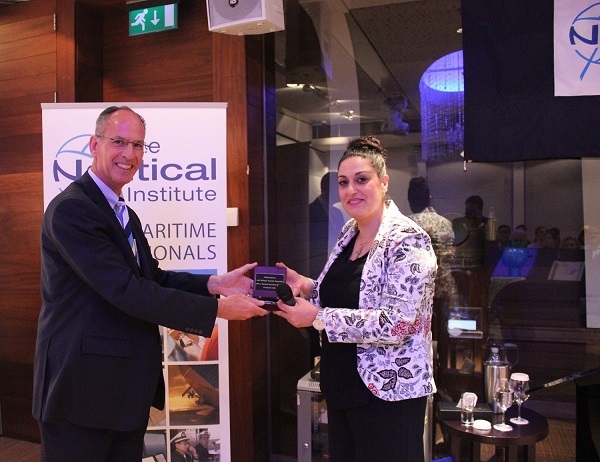 The Nautical Institute Cyprus branch invited Captain Iakinthi Tzanakaki to speak about the award and her thoughts on the challenges faced by the modern shipmaster. 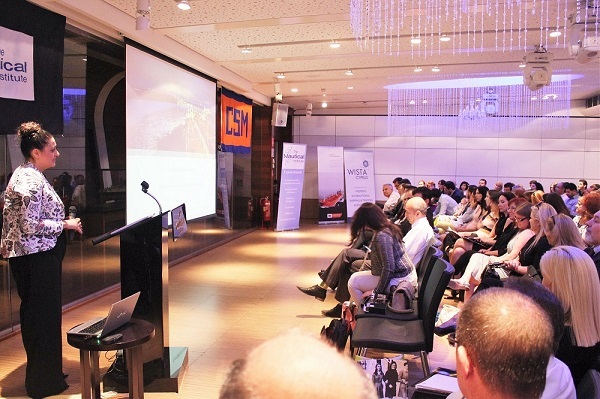 Columbia Shipmanagement, Women’s International Shipping & Trading Association and Tototheo Group supported the event. The interest was evident from a packed hall with around 140 participants. The Chairman, Capt. Graham Cowling welcomed the participants and speaker. Capt. Tzanakaki briefly mentioned about her career and her organization to provide a context to the episode. The incident occurred in the Bay of Beirut at the Total Terminal. There were two tankers at berth as per Figure 1. Both anchors were laid out ahead and the stern was aligned with ropes to four mooring buoys. Initially, the wind was from the starboard beam of the ships, a calm 5 knots. The ship-shore checklist was exchanged. The terminal guidelines provided that if wind speed would reach 25 knots, cargo operations should be stopped, tugs were to be called and hoses were to be drained. Around 1 a.m. that night, the wind started to pick up, as is quite common in that region. The wind was still blowing from the starboard side but at 27 knots. Captain Tzanakaki ordered the cargo operations to stop and asked the Mooring Master to call the tugs. The Mooring Master was skeptical if such measures were really necessary. Captain Tzanakaki assured him that she would take responsibility for the consequences. He was skeptical but she assured the Mooring Master that she would take the responsibility. She ordered engines to be prepared and crew to be standby. As the wind speed reached 37 knots, one starboard spring parted. Three minutes later the second sprint too parted. Now no starboard lines remained. Since there were no lines checking the movement of the stern to port, the bow started heading to the wind. The distance reduced to 50 meters. There was no sign of the tugs. Only the stern lines were holding. Captain Tzanakaki ordered the ropes to be released by brakes. By now the stern was very close, almost 20 metres from the other tanker. (Figure 2 & 3). Captain Tzanakaki ordered full ahead on the engines and the Bow thruster to port. After a few critical minutes, the danger of collision passed. Once clear of the other tanker, Captain Tzanakaki ordered the engines to be stopped to check if anchors were fouled. After confirming that they were not, the anchors were weighed. The ship returned to resume operations once the wind had subsided. • A risk of collision and subsequent fire/ explosion. • Risk of pollution as other tanker was still discharging cargo. • Risk of damaging terminal’s mooring equipment. The ship later realized that during their escape manoeuvre they had passed very close to the buoy which was carrying the cargo hose. • Risk of crew injury as there were no additional mooring personnel and the ropes had to be handled under time-pressure. • There was a regulatory framework for the protection of the vessel but these were never implemented. The tugs never appeared on the scene. The ship’s crew always remains in charge of the safety of the vessel and has to prepare for a worse-case scenario. • A risk assessment was carried out before the operations but the risk that appeared was very different from that imagined. • Sometimes there is no luxury of time for decisions. There were only two options – take the risk and do what she did, or do nothing and collide. • One may have procedures and checklists but ultimately it is the critical judgement which takes us out of crisis. • Technology did assist but it is human critical judgement which will take us out of a tight situation. It is your judgement and expertise which will take you out of such a situation. The balance of traditional seamanship, critical judgement and technological advances is a fine one. Captain Tzanakaki was thankful to the team onboard who followed the instructions and did the best they could do. Without teamwork, it would have been difficult to respond to the emergency safely. • The younger generation of seafarers has a high affinity for technology, and older generation were very good in classical means of navigation. She felt she was fortunate to be in the middle. • Humans will always be required for the ship as this incident showed. • The principal importance of committing oneself to a traditional shipping company, which is effectively investing in the long term advancement and growth of its Officers and Crew is of paramount value. • Shipping is about people. And the culture which each company symbolizes and operates upon is of vital importance in its success and retaining the best and most committed team. An interesting Q&A session followed the presentation. The Chairman, Captain Graham Cowling thanked Captain Tzanakaki for the interesting presentation and the participants for attending. The interesting event was followed by a snacks and cocktail in the adjoining room.